Baseball site by Ethan Resnick offering pitcher analysis and predictions. 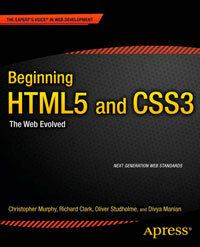 A lot of new HTML5 features in this site, which is good to see. That said, the hgroup element should contain one or more h elements only, and therefore incorrectly used here. I’d recommend replacing it with a header. The cite element is also used incorrectly here as a person is not a work (the spec says: The cite element represents the title of a work). I note usage of the search input type which is a nice touch.